In case when your Outlook is not connecting to Gmail and your credentials are not accepted, you may want to fix that. In this article we will show you how you can do that. The problem is that Outlook keeps asking you to provide Server, User Name and Password and there is no matter how many times you click on Ok, it keeps popping up. After some time it gives you an error. This issue occurs when basic authentication has not been enabled for a Gmail account. So we need to get rid of this situation. 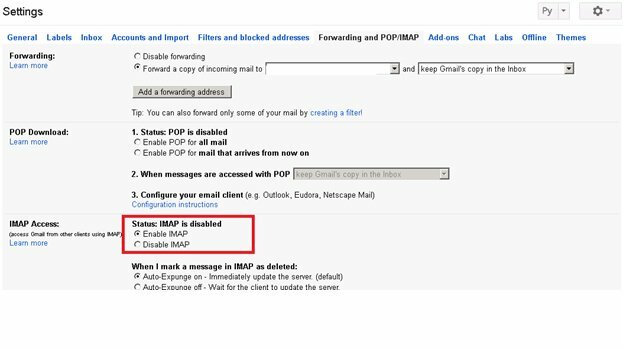 So let’s configure Outlook and see how to resolve the error (you can also take a look on our guide on how to setup Gmail in Outlook 2016). So, the first thing we need to do is to enable POP/IMAP. Log into your Gmail account and click on small gear in the right top of the window and select Settings. After that, go to Forwarding and POP/IMAP tab. 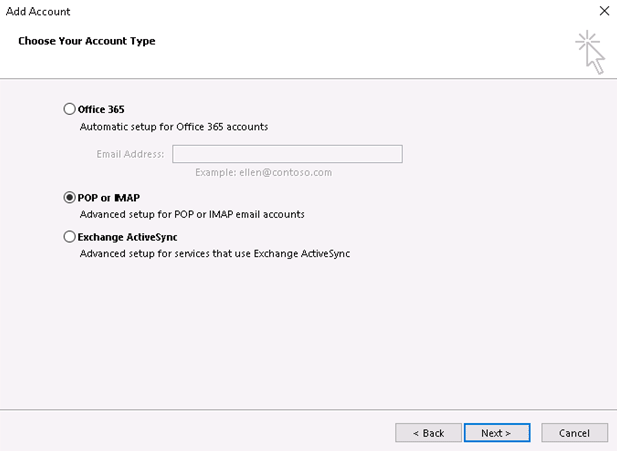 Here you can see that Status: POP is disabled and Status: IMAP is disabled. You can choose either one of them, but we are going to enable IMAP. Once it is done, click on Save Changes. 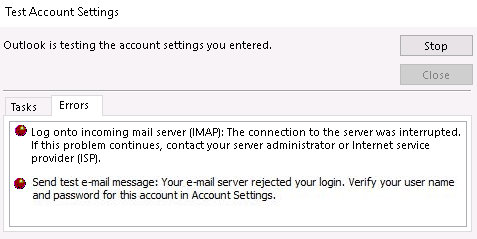 The reason behind selecting IMAP is that IMAP is a special protocol of communication between the e-mail client and the mail server. It means that if you open your mail on web browser and perform some actions on Outlook, then you can see the changes turn to Outlook instantly and appear on the web mail. This is not a case with POP. Now go to the Start menu and open your Outlook. Click on FILE and then click on Add Account. From here select Manual setup or additional server types and click on Next. In the following window select POP or IMAP and go ahead. Now type in your name (this name will be displayed in the emails you send) and email address. 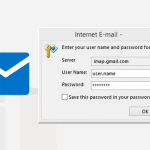 As the account type select IMAP and as incoming mail server type type in imap.gmail.com. Outgoing mail server (SMTP) is going to be smtp.gmail.com. Also, you should fill the Logon information form and then click on More Settings. 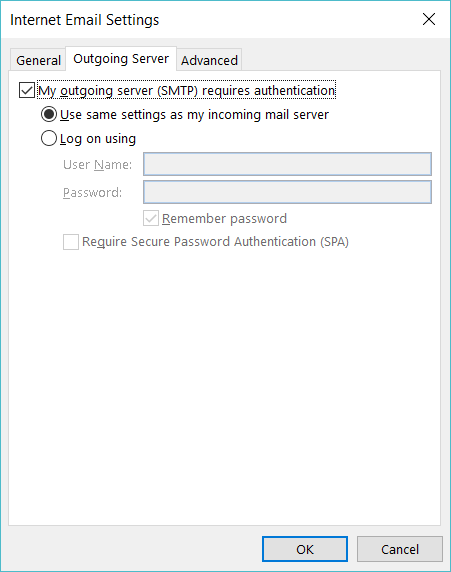 The option Require logon using Secure Password Authentication (SPA) should not be checked, because this is a proprietary Microsoft protocol based on NTLM authentication, which is not supported by Gmail. 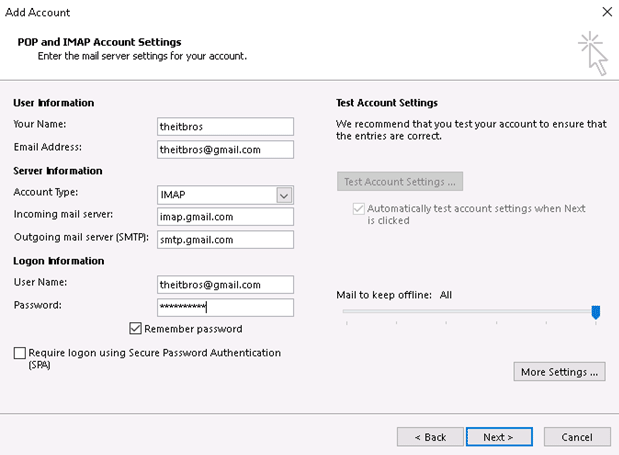 Go to Outgoing Server and tick on My outgoing server (SMTP) requires authentication. 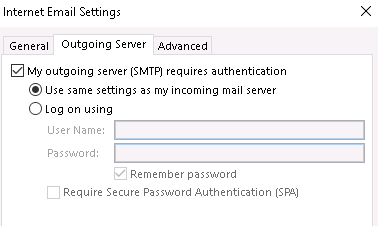 Now, go to Advanced and change some mail server settings. 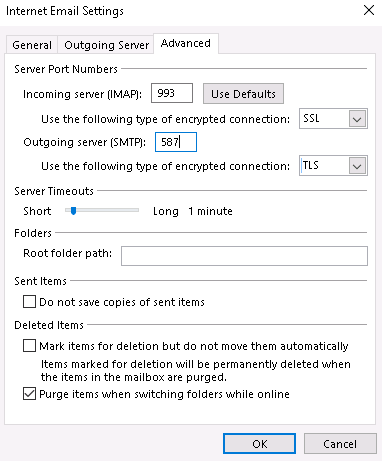 Select SSL to encrypt your connection for Incoming server (IMAP) by selecting from the drop-down list. The port number for IMAP should be 993. For the outgoing SMTP server select TLS as an encryption protocol and change the port number from 25 to 587. Click on Ok and go ahead. Now you can see, that there is the same form we have earlier. We still cannot connect to Gmail, but the error is not the same. 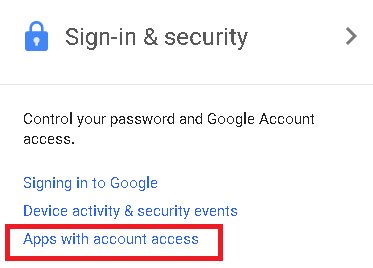 So, as explained in the beginning, this issue occurs due to the fact that you have not enabled the basic authentication for your Gmail account. The fact is that since July 15, 2014, Google has strengthened the protection of accounts by blocking applications that use a simple validation for access the Gmail mailbox (such as Outlook). Currently, Outlook does not support OAuth and 2-Step Verification, so the only way to allow a connection for Gmail via Outlook is to use App-Specific Password. You can enable this feature only on Google Account website. Let’s see how to enable this feature from your Gmail account. You must use this password (without the spaces) instead of your password from the Goggle account when you connect to the Gmail in Outlook. 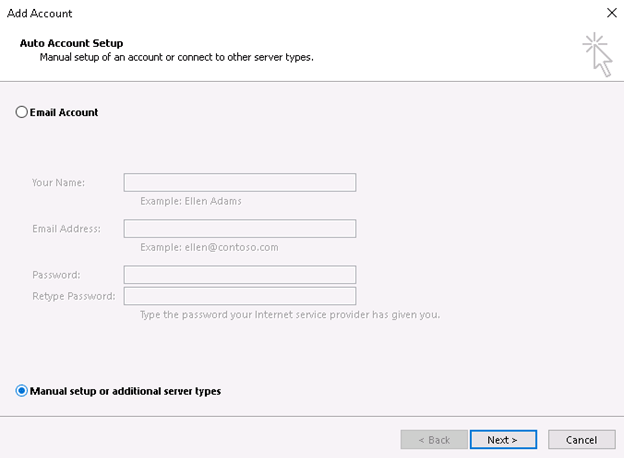 Once it is done, go to Outlook and just try to connect again with newly created password. If you have set up everything properly, both test tasks for verifying the connection to Gmail will succeed. As you can see, the process is completed successfully and you will see that there is no Outlook not connecting to Gmail problem. 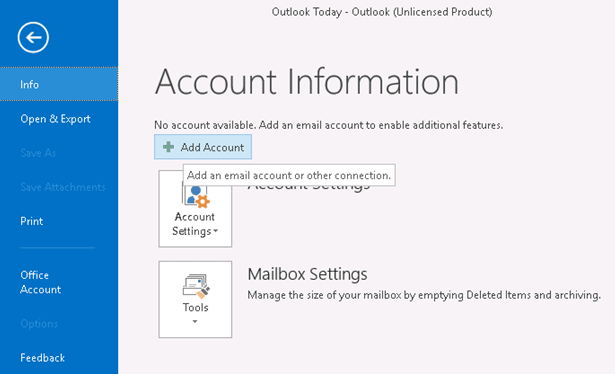 That’s all, your Outlook account for Gmail has been configured now and issue when Outlook not connecting to Gmail is solved. It will download all your mails and synchronize all the information. What happens when you keep getting this after everything’s been enabled and every setting is correct? The advice to switch off secure authentication is not smart at all. 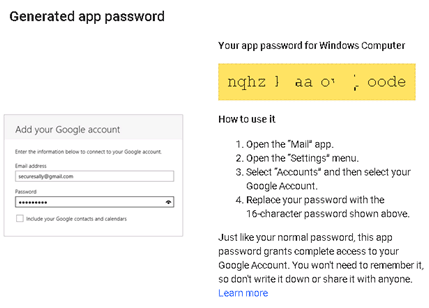 You basically need to create a special password for any app using your gmail. Which is very secure and smart. Ranbir, understand the subject and issue before offering some irrelevant link. For others who actually read this informative article, the app password, now gmail has basically forced out apps it doesn’t like, only works with 2 factor authentication turned off. Security is important, but the paranoia is intentional and pushes us towards using the primary system rather than better options (such as Outlook in this case). Thank you SO much. I read about a dozen posts trying to figure this out. Yours was the only one that successfully connected my gmail account to my MS Outlook 2016 desktop client. You rock! HI I have tried all your instructions and still cant connect my GMAIL to OUTLOOK?? Finally I decided to use the default mail client on my windows 10 system, got a popup to trust my system and finally the default mail client was working. Then I tried outlook 2016 again, and now it is working. That was the only solution to get my system in the list of trusted connections. How do you ” use the default mail client on my windows 10 system”? I have tried everything and get no where – gmail synchs one day and then stops! Not sure about the other comments but when I implemented your advice and I selected ok to accept “unsecured” apps then retried my login from Outlook 2010 it worked perfectly. Thank you for your assistance. Perfect. I’ve been searching for a solution to this problem for months and had all but given up. Thought I would give it one more shot today and your site came up. For some reason, it didn’t show in my previous searches. You’ve solved my problem and made me immensely happy. Months of frustration and annoyance are fixed. I’m smiling and over the moon happy. Thank you! Had identical issue and unfortunately performing these steps get my issue solved. Tried changing Gmail password several times and it still didn’t work. Then decided to contact guys at outlooksupport.4team.biz . They solved the issue by adjusting something on Gmail account. Same here. Tested with 2 separate gmail accounts on 3 different machines: Win7+O2010, Win7+O2016 and Win10+o2016, nothing but failure across the board. Please could you explain, i generated the 16 letter verification code online on gmail – where does this get inserted into outlook? If you still cannot connect, you may need to change your firewall security settings from high to medium. Please add my name to the list of “thank-yous” for this article. It solved my problem. Another thank you! – I couldn’t have got my new gmail account working in Outlook without you. Signing in with Mac Mail was a breeze. But Outlook on a PC a nightmare. Gmail themselves tell you NOTHING about the essential steps you outline – not impressive. BRILLIANT!!! You dear sir are a God-send! I was up to up neck with Gmail kicking me off my original Outlook setup. Your advice was clear, succinct and my problem has been solved! That ladies and gentlemen is what customer service is all about! Cheers to you guys! Thank you! One of my gmail accounts stopped connecting and I have been working on this for weeks. Finally reinstalled office 365 and set up all my email accounts and it still didn’t work. This worked! Thanks again. thanks heaps for your clear directions it helped me set up my gmail after months of trying to work it out. I’m also trying to connect my G Suite email to outlook. it doesn’t appear to be the same process. outlook has a .pst file for it but doesn’t show the account. any ideas? My exchange accounts are finally working again!!!!! Easy instruction for the computer dummy I am!!!!! !